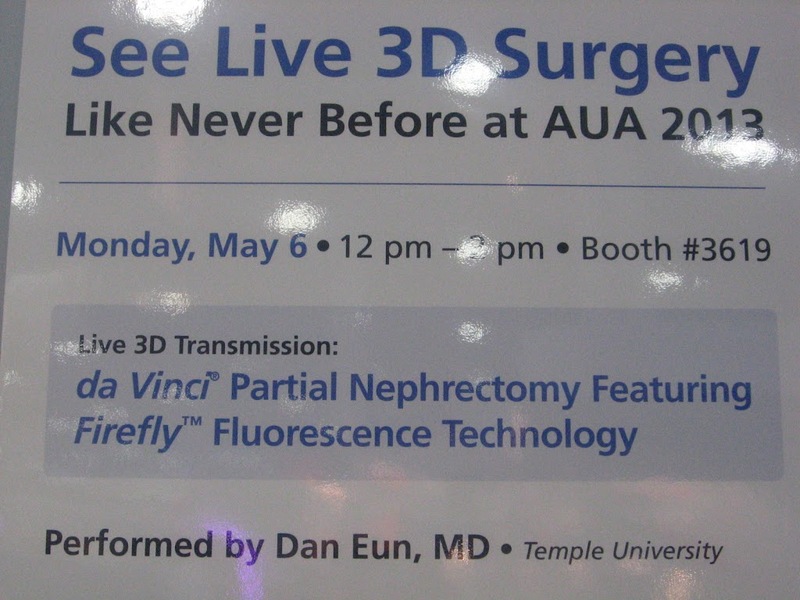 3D Live Surgey- first ever! 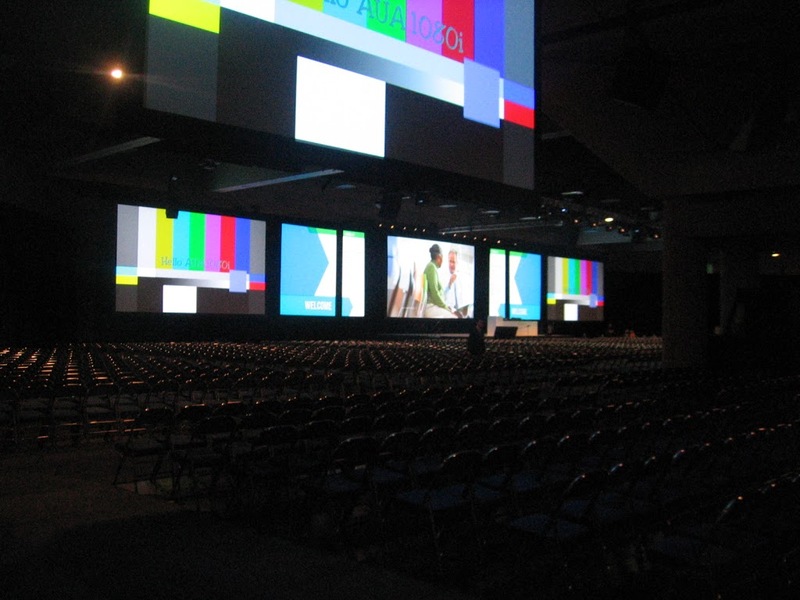 One of three seperate locations at the San Diego convention center, this is a 3000′ seat auditorium with huge projection monitors, which really highlighted the quality difference between our HD satellite feeds and video conference systems. Control room for the above auditorium, with the Boxline Box equipment occupying a small corner of the graphics table. When most people think of 3D video, big blockbuster movies come to mind. 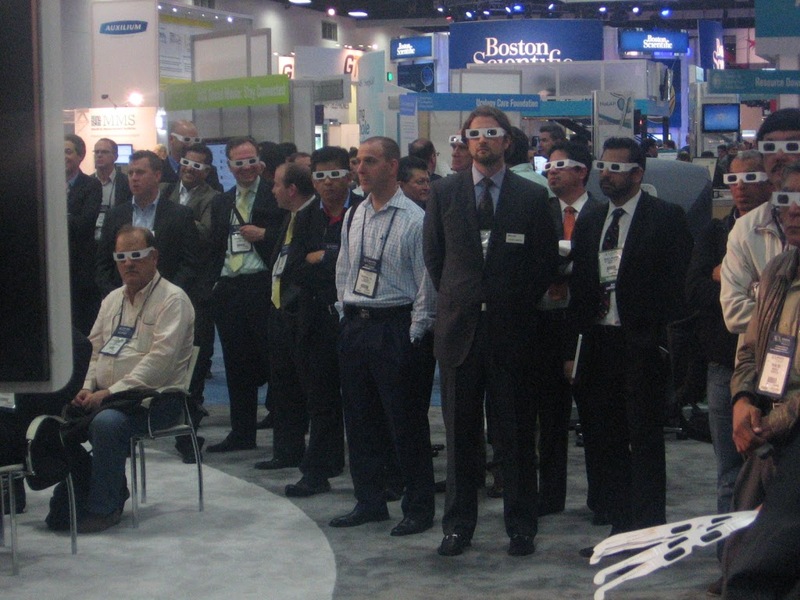 3D-TV has not really penetrated the home market as quickly as HD for example. Most of the content available to home viewers is produced content, not live video. 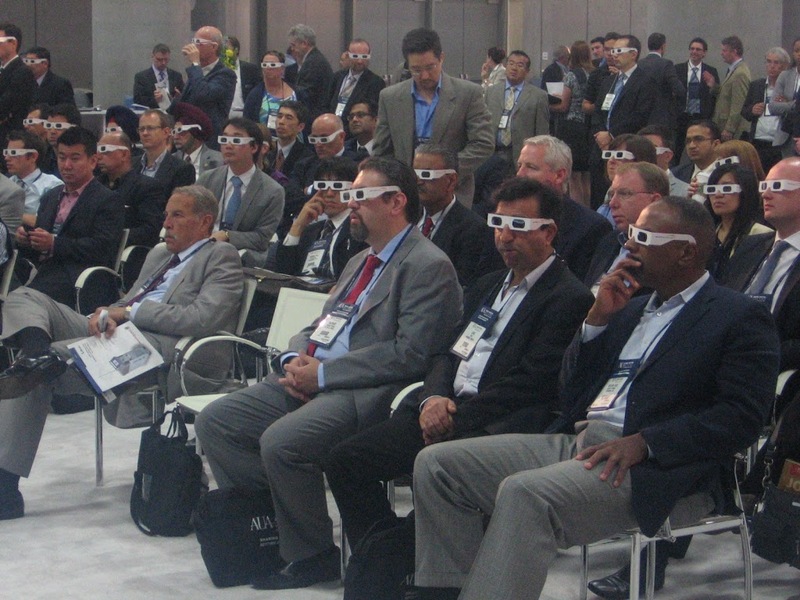 As a live transmission company, producing a live 3D broadcast presented a lot of challenges in uncharted waters. DCI recently worked with Boxline Box medical communications to transmit the first-ever live broadcast of a 3D surgery at the American Urology Association (AUA) annual convention in San Diego, CA. 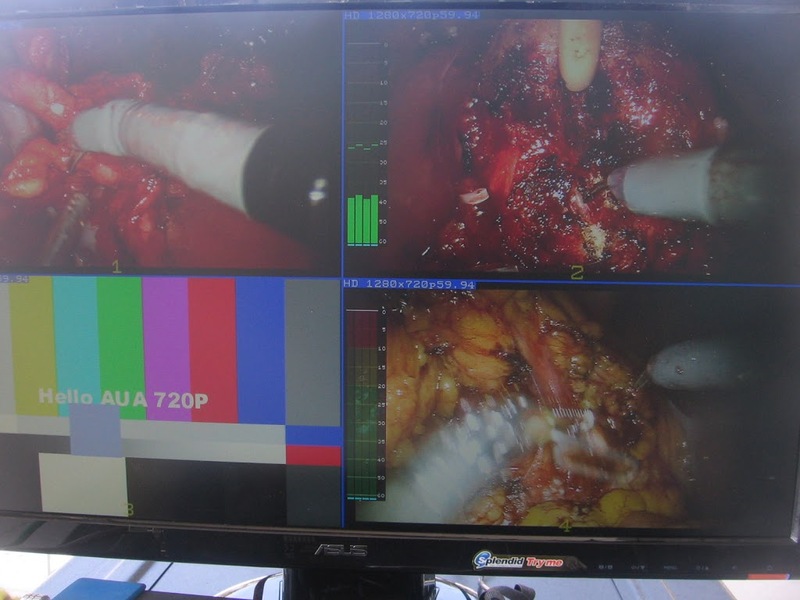 While most medical broadcasts are done via videoconference, Boxline’s highly experienced Operating Room video staff and DCI’s quality-obsessed field uplink engineers combine perfectly to produce the best looking live broadcasts in the medical communications industry. 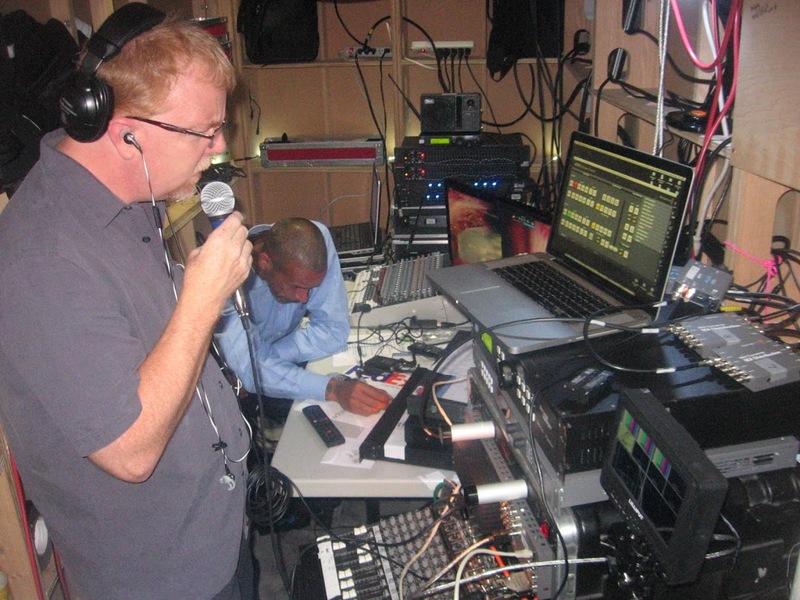 DCI and Boxline Box have worked together for several years to coordinate the transmission aspects of live surgery broadcasts. We handle brokering satellite trucks, coordinating space segment, and doing quality-control of the live feeds from our teleport to ensure the highest quality picture possible in the bandwidth available. 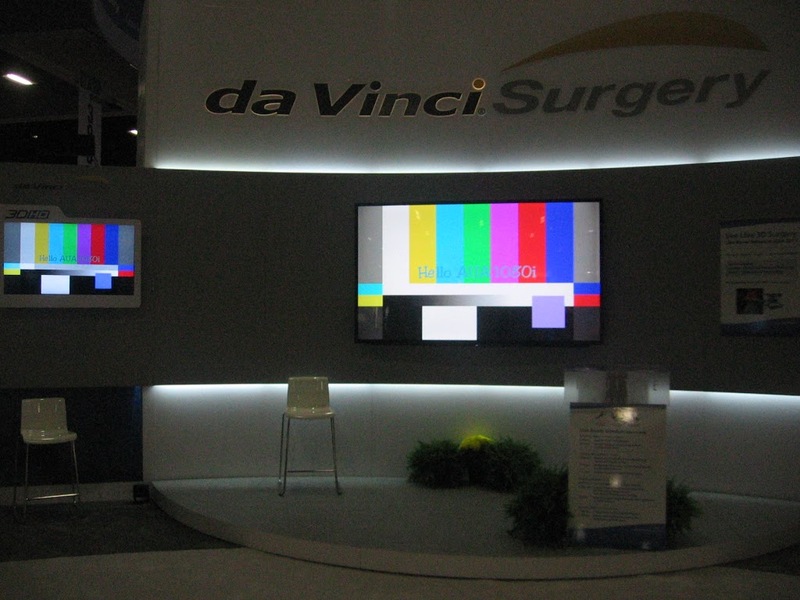 Boxline Box handles the OR video production, return audio so the attendees can ask questions of the operating surgeon, and switching the local feed at the convention. When an event is big enough, DCI will travel to personally handle the transmission. 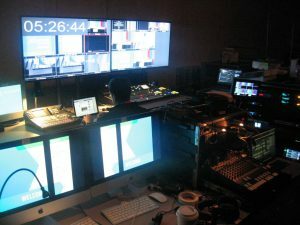 Such an event is the AUA annual conference, held this year in San Diego, where we downlink three or four simultaneous HD feeds from trucks we coordinate all over the country. 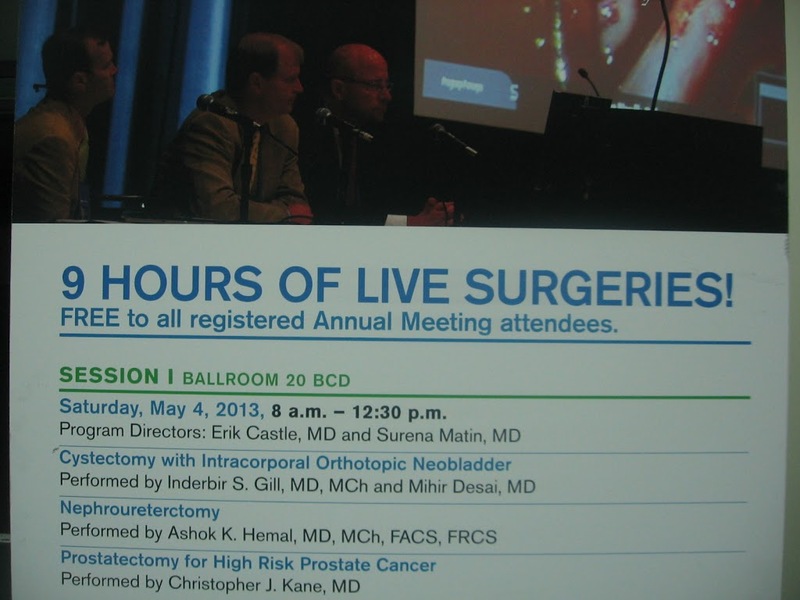 Three separate HD live surgeries. 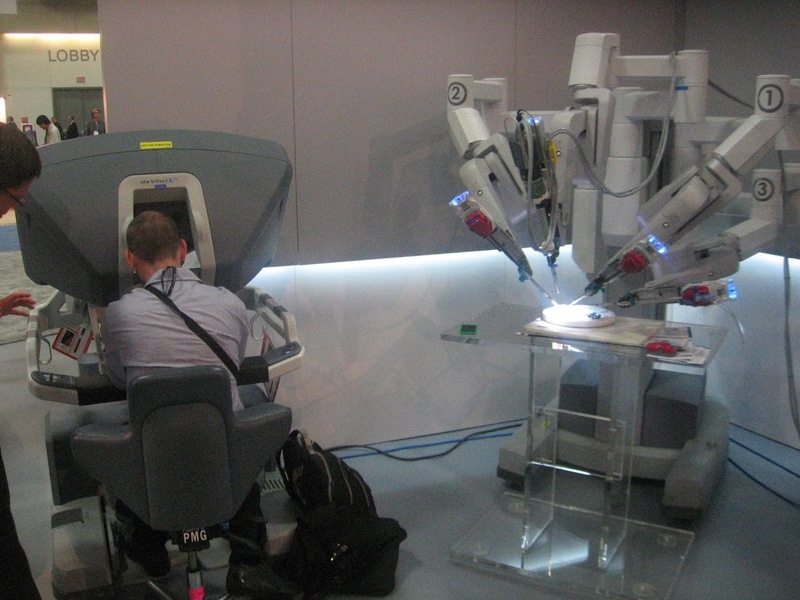 The AUA conference includes a lot of live video from the daVinci robotic surgical system, which natively works in 3D for the surgeon doing the procedure. All the previous feeds we have done were all standard 2D HD, but this year we stepped it up a level to provide the same 3D HD video seen by the operating surgeon. 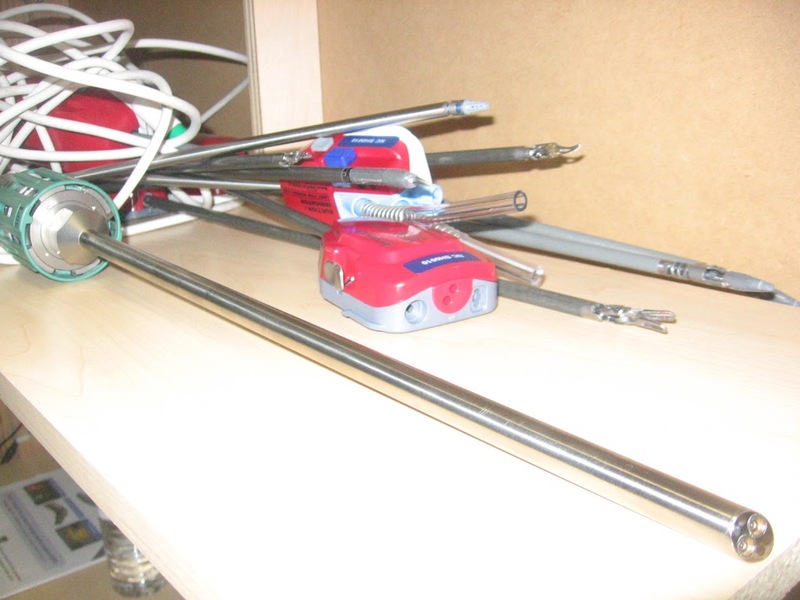 daVinci system surgical “tools” including the 3D scope. The cameras are contained inside the green cylinder and lenses are at the tip of the scope. 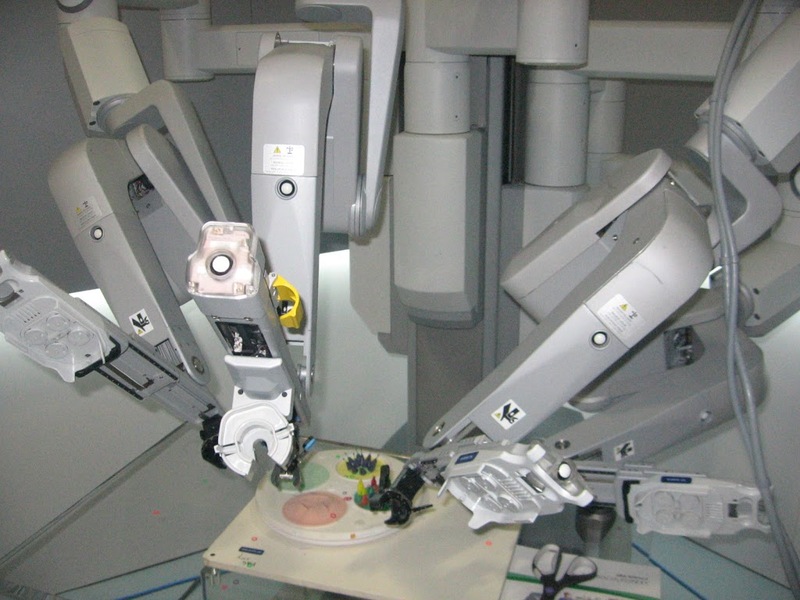 A surgeon controls a live daVinci robot. There is also an electronic simulator with the same console but the robot arms are virtual. Because the data required to carry uncompressed 3D HD video exceeds the 1.5gbps defined in SMPTE-292M, commonly known as HD-SDI, there are two ways to carry this content. SMPTE 424M is the most simple within a production plant, it uses a single coaxial cable with a data rate of around 3.0gbps. This interface is commonly referred to as 3G-SDI, although the “G” stands for gigabit, not “Generation” as 3G cellular standards. The only problem with 3G-SDI is very few HD encoders and receiver/decoders used by satellite trucks and teleports are capable of handling it, and the few that do require expensive license keys which no one has purchased due to the lack of 3D transmission requests. 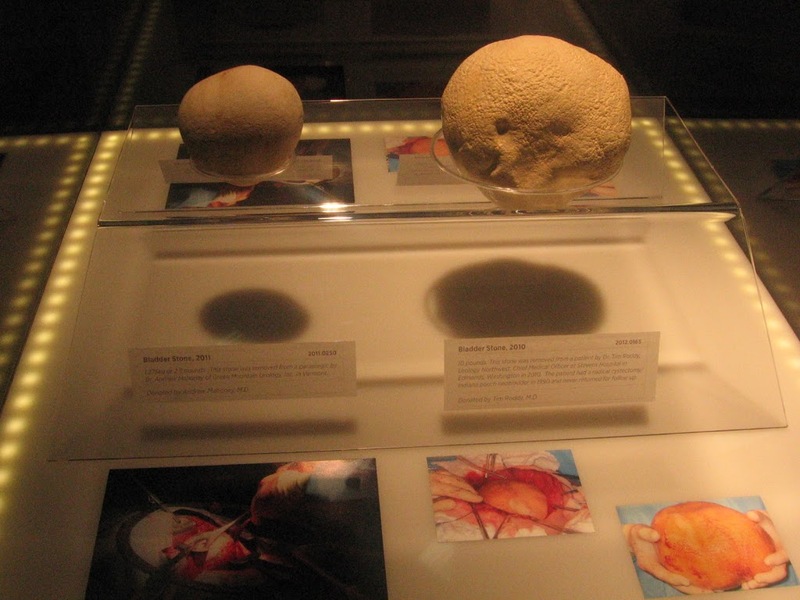 Competing for attention was a display of two grotesquely large human kidney stones. Testing the 3D HDMI converter with a uplink from DCI that same day. The second standard is known as dual-link SDI, defined in SMPTE 372M. This standard is nothing more than two HD-SDI signals running on two cables, one for each “eye” in a 3D video system. Converting back and forth between 424M and 372M is fairly simple using a converter such as a Matrox MC100. We can transmit a dual-link signal using two encoders and two receiver/decoders. Doing two paths is no big issue for most trucks, the issue for a 3D broadcast is both decoded video signals must arrive at exactly the same time. 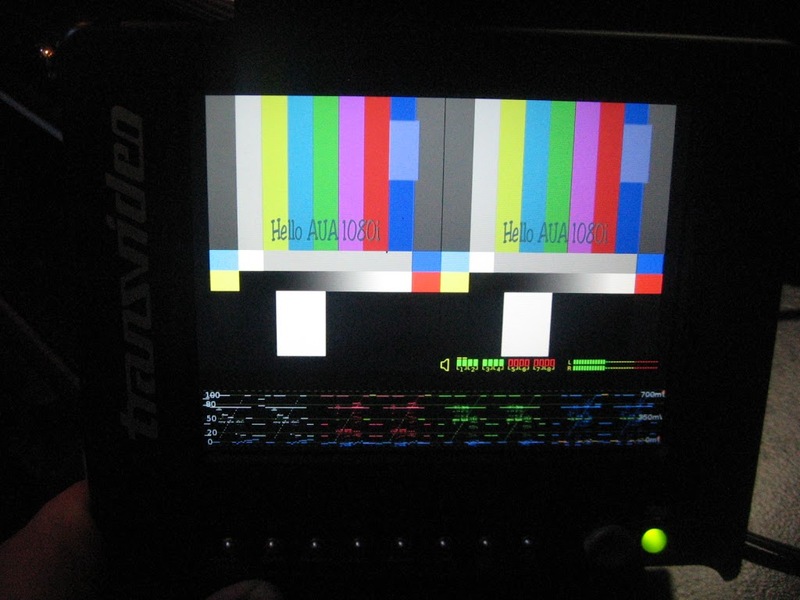 Slight variation in firmware or seldom adjusted settings like GOP (group of pictures) and PAFF (Picture-adaptive frame-field) can cause millisecond propagation delay (the delay inherent in any encoding/decoding and satellite transmission system) differences that can throw off the picture when both “eyes” are combined on the viewing monitor. Most compression hardware manufactures have proprietary solutions to time the encoders or decoders with genlock or other methods to make sure the two paths line up exactly. These solutions are expensive and not practical for most events because they are not standards-based and require matching equipment on both sides. Boxline Box owner Mike Evans talking on the return channel behind the scenes at the daVinci booth, one of 3 locations we used at the AUA convention and the site of the live 3D broadcast. 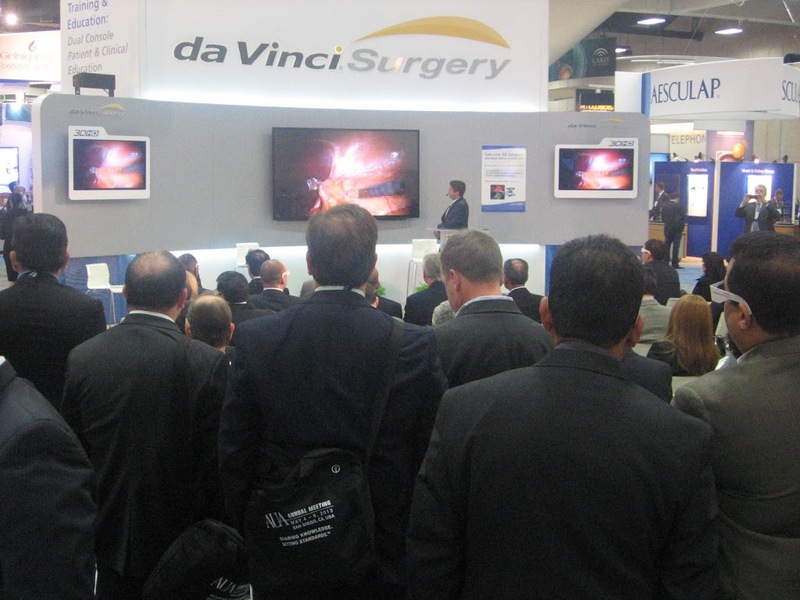 Standing-room only at the first live 3D robotic surgery broadcast. 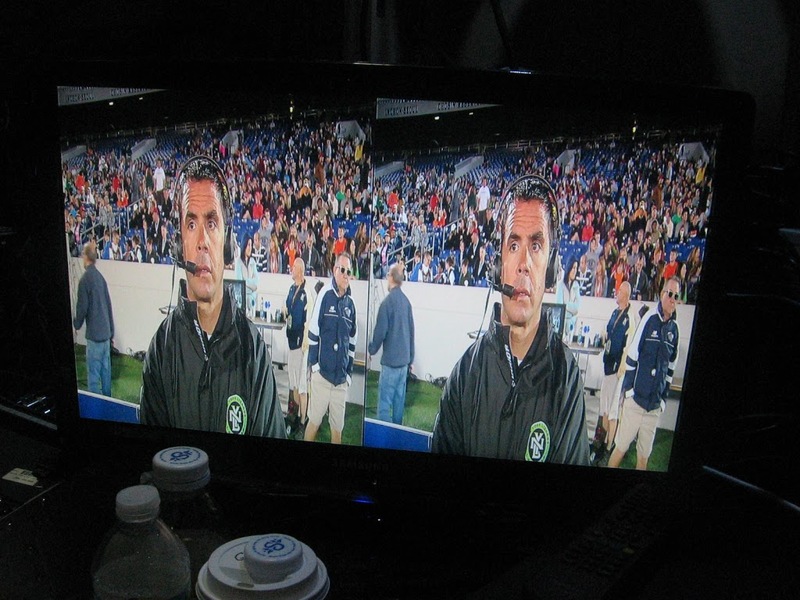 Our live 3D broadcast used two matched HD encoders with DCI downlinking the two signals on standard receiver/decoders. We fed both signals through a two-channel Aja FS2 frame synchronizer which times them together as a reference, but does not do anything to any propagation delay differences. from there, both signals went into distribution amplifiers, where one “eye” was broken off and used for 2D-only displays and recording. We had rented a PrimeImage Pipeline, a piece of equipment typically used to dial in 10-15 seconds of delay to allow producers to “bleep” objectionable language on a live broadcast. The delay line is capable of frame-accurate delays, so if one path was even a frame or two ahead of the other, we could “slow” it down to make them match exactly. Once both “eyes” were exactly lined up, they went into a Aja Hi5-3D, a dual link SDI to HDMI converter, which takes both “eyes” and splits them into a standard HD picture. This signal is fed to the 3D-capable TV’s which when set to the proper 3D mode, stretched the two halves to fill the screen so when viewed with polarized 3D glasses, the image appears 3D. DCI flyaway and HD receivers on the first day before moving the rack indoors. DCI is happy to work with our friends at Boxline Box on this ground-breaking broadcast. If you have a special project that needs a dedicated and experienced transmission company, contact DCI. And if you need to produce a medical-related video, contact Boxline Box!